Fingerplays are a wonderful way to involve your baby in a game that will develop literacy. Not only will you find that a little one loves to have your undivided, loving attention, but you'll know that you're laying a foundation for reading, writing and communication skills when he's older. By participating repeatedly in fingerplays like that, your baby is learning to predict, learning about rhyme and rhythm, picking up language and making meaning from it, and learning new vocabulary in a context she will grow to understand. I used to use fingerplays with my Kindergarten students. Some help children learn manual dexterity, as well as teaching them all sorts of vocabulary, and the fun of playing with words. Some fingerplays can reinforce particular sounds/letters too. Here is the church, here is the steeple - demonstrated on video. Education Oasis has words and actions for a great selection of fingerplays and action verses. Reading Is Fundamental has a lovely page with videos that demonstrate actions. Thebestkidsbooksite offers a list of fingerplays plus actions in a drop down menu. Dr Jean shares some favourite fingerplays on Youtube and Teachertube. 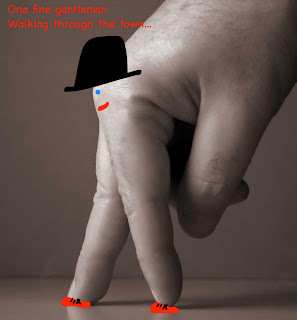 There are lots of fingerplays shared on Story Time Secrets blog, and I love the children's literature links too. Story Blocks also has videos of great action songs and fingerplays that contribute to literacy. Songs for Teaching want you to buy their product, but generously share words and music for many fingerplays. Googling "fingerplays" will bring you many more. Something else I love about fingerplays is that they lead naturally to songs with actions like When Goldilocks went to the house of the bears, (hear/watch it online)and Skinnamarink. I don't think it's important if you don't know the traditional actions - invent your own! Fingerplays help children build vocabulary by using new words and sounds. With repetition, over time kids internalize so many facets of our language, and develop a love of word play, rhyme and expression. If you want to add to the fun, make some finger puppets with your child, or draw on your fingers to represent characters. Older siblings might enjoy creating their own fingerplays, too. If you need inspiration, check out Creative Prompt - Innovate on Something Else. If you found this post useful, and know someone with babies or toddlers, I hope you'll share it with them. And if you can, find time this month to share a fingerplay you like with a baby or toddler who's close to your heart!